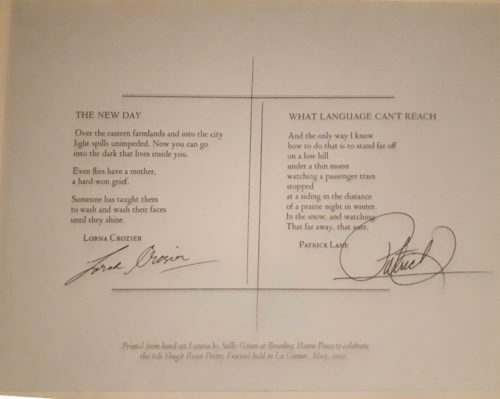 Two exquisite, yet for me enigmatic, poems by the Canadian poets Lorna Crozier and Patrick Lane, partners for more than forty years before Patrick’s death eleven days ago. This broadsheet hangs in my home office and I revisit it now again. And every time I feel happily lost in a lyric mysteriousness, much the way I do when I read Nobel Prize Laureate Tomas Tranströmer whose poem Tracks concludes this blog post. I have to leave my head, my mind behind when I approach these poems. I have to ask my heart what it sees what it feels. And I get to love the haunting spareness of both of them! Their language and images. I have to surrender to the images first and only while immersed in them allow my mind a little wiggle room with the huge thoughts, huge abstractions. First, in Lorna’s poem: a dark that lives in us and hard-won grief and second, in Patrick’s poem: what language can’t say, can’t reach. into the dark that lives inside you. With Lorna’s first stanza I can let the image and huge thought co-exist. The brightness of a day, the darkness of our inner thoughts. But then the leap to hyper-space! The image of the flies, their mother and a hard won grief. And then the shining over-washed faces of the flies! That shining that links back to the sun’s light spilling! Where am I left with this poem? The images of light and dark. The sun on a prairie morning. And its opposite: the dark inside us. Flies that thrive on garbage, on darkness. Who create eggs, life, in that darkness. Who find their own ways to shine! Who have mothers and grief. I love this little poem for how huge it is and how my mind can’t wrestle it to the ground but, also, how my heart can say this is a world I know and no matter how hard it shines, or I shine, there is darkness, too. There is grief: inside and outside. And there is beauty! And in this confusion and mystery I am at home! And my heart also, here and now, reminds me of my grief at Patrick’s death. of a prairie night in winter. In the snow, and watching. That far away, that sure. The size of the abstraction in Patrick’s title already has me off balance before I trip on the first lines and then fall face first inside the cold, crisp images of a prairie night and a thin moon and a train, at a siding, stopped. Those first lines: And the only way I know/to do this is to stand far off...To do what? Reach into language? Is language the train? Everything inside it unreachable and unknown? With Patrick’s poem my mind says: what? My mind wants a story, a narrative, something Patrick does so well. Language I can understand. But here he eschews narrative and gives me a puzzle: what language can’t reach. And then he shows me this scene. And maybe that’s the only way he can show me what language can’t reach. It can make a picture but the rest stays unsaid. Cold, pristine, in the distance. Sure, to the poem my mind might say: what? But my heart says: wow. The severe beauty of a winter night. And a thin cold-struck moon. And the surprise of a train. Its lights. And how remote it is. And a man watching from far away. Safe. A night on a prairie so large and a train, even in the distance, so imposing. The scene is big and I feel small. And my heart says, like language makes me feel, some times. And it’s okay! When I read Patrick’s poem I can’t help but think of this poem below by Tranströmer, a poem I know Patrick knew well and liked so much. This third poem to add to this post, to celebrate the beauty and mystery of the lyric poem! With thanks to Crozier, Lane and Tranströmer. This entry was written by Richard Osler, posted on March 18, 2019 at 10:29 pm, filed under Poetry and tagged Lorna Crozier, Patrick Lane, Tomas Transtromer. Bookmark the permalink. Follow any comments here with the RSS feed for this post.